Tonight was a yummy meal that was very filling and hearty, perfect for 13 degree weather! Last night I tossed a pork loin in some garlic, season all, and chachere’s cajun. 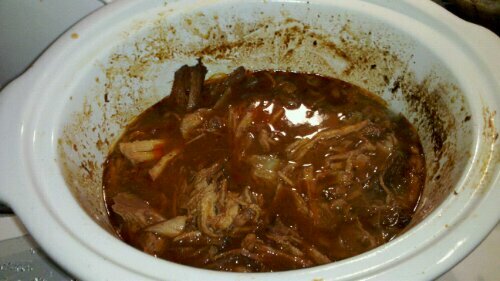 Next I threw it in the crockpot with some water, white zin, sweet baby ray’s bbq sauce, sweet and sour salad dressing, ketchup, and garlic/onion sauce. After letting it marinate all night, we set it on low just before 8 and let it cook almost 12 hours. What resulted was pork that fell apart and was so tender and juicy…a perfect sandwich! 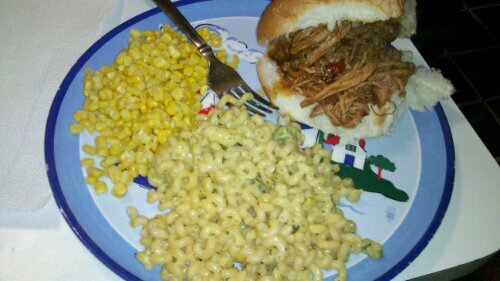 My husband prepped corn and a brocoli/cheese pasta. A great meal! Yum!